We are marble exporter and Marble is a Metamorphic Stone and mainly consists of calcium and dolomite. It ranges in many colors and is usually heavily veined and shows lots of grains. Hardness rates from 2.5 to 5 on the MOH Scale. 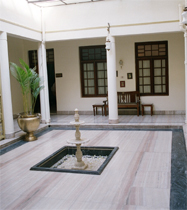 Though Marble is available in many shades and colours. We are the marble exporter in the best quality in india. Marble exports include Tiles, Slabs, Balusters, Columns,Capitals, Fountains, Fireplaces, Pots, Urns and various carved articles in Rajnagar White, Morbad, Indo, Makrana White, Forest Green, Emerald Green, Golden Green, Fantasy Brown, Bidasar Brown, Bidasar Green & Jaisalmer Yellow. Marble and Limestone begin as the same material. Marble is simply changed limestone, or to use the technical term, metamorphic. Given enough heat and pressure, limestone will crystallize, resulting in marble. The crystal structure allows marble to take a polish, and bring out the color of the other trace elements.